you put faith in adebeyor...well, someones got to. 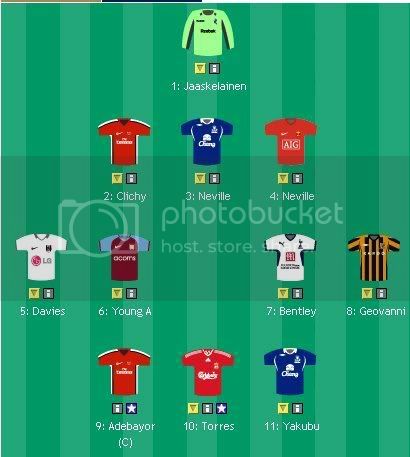 I have 3 players in leavis' team and 3 in andrew's. 2 of those 3 in each team are the same. Waiting to see how Bentley does this season, could be quite interesting. Hate him. He's one of those players where he plays crap alot of the time but still ends up getting 15 points. We should do Reps to the leader every month or something? You owe me 6 points ron if Neville doesn't play and united get a clean sheet. My team are ready to go waiting for the gun. I think most of u have missed the biggest bargain but u will have to wait and see who it is. Ha ha same tatic as I'm playing too. I'll have messed up and used by my wildcard by the time CRon gets back, so I'll probably think about him then!